Yup, I'm too lazy right now to think of a cooky post title. Who cares anyway cause all I really care about are the pictures right? Well here's what I've been up to. One of my oldest WIP's is finally a FO. I guess dragging it out from it's hiding place motivated me to actually finish it. I don't even know why I put it off for so long. I still have to block it but hopefully it won't take me as long to do so. I revisited my roots by crocheting this hobo bag. As you can see, I still have to seam it up. I'm going to donate it to my Purls of Hope charity project at work. The yarn was gifted to me by Yarn Hippie and it's the new simply soft shadow stripes yarn by caron. Of course I fudged the pattern all up. Somehow I failed to notice the last word of every line (turn). I didn't realize this until I was about 80 percent done so there's a big ugly seam up the back but I'm OK with it. I don't rip my work until all other options have been exhausted. My Baudelairs are coming along beautifully. I was a little apprehensive about the reverse heel flap but it wasn't that bad. I think I like it better than the top down heel flap. So I just have to do the leg and I'm done. I've joined a spinning roving swap. 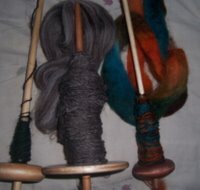 You can either swap roving or if your new to spinning or want to learn, swap spinning kits. See details here. Here's what I have sitting on the spindles right now. From left to right, on the bottom whorl is some dark grey roving that I tried to over dye. I'm not too pleased with the results but I just wanted to see how it spins up. In the middle is some grey roving that reflects a smallportion of my pound that I got from the Sheep Shed Studio. I've been working on it for over a week now and I'm tryingto spin up enough to break the 100 yard mark once plyed. The last spindle holds some corriedale that I dyed a while ago. I'm just trying to spin it up so I can make some room to justify dyeing some more roving. Speaking of dying roving, I just dyed some roving last night. There was an interesting thread on crafster for last weeks Fiber Friday that spoke of the Wilton dye method. Pixiefarts posted the most vibrant yarn that was dyed using Wilton dyes and it was pretty hard to fathom because most of us have never gotten those results. Well of course I had to try it myself and here are my results. I used royal blue, kelly green and burgundy. It came out a little more blue than I wanted it too but I like how psychadelic the colors are. 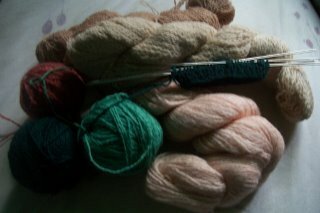 I was at the farmers market down in Union Square last weekend and a vendor was selling handspun merino yarn. Since spinning I haven't purchased any yarn but I just wanted to take a look and see what he had. I was about to leave when something caught my eye. There was a bucket full of raw wool labeled "Grease Wool" down near the bottom of the tent. I quickly purchased a half of a pound before I could talk myself out of it. During this past week, I washed a small portion of it, and carded it while I spun it up. I'm on a tight budget so I didn't want to spend fifty plus bucks on some hand carders so I got a couple of dog brushed from pet land for under fifteen bucks. Yes it takes longer but I'm cheap (enough said). I also added in some firestar while I was carding although you can't really see it in the picture. It was a long process but I am so proud of my little handspun skein! Bags, bags and more bags. Yup, I love sewing bags. 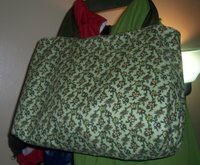 I think all the bags you see below were made using fat quartes that I purchased from my new favorite shop the City Quilter. They're like 4 blocks from my job and I love their selection. Of course I had to join Necia's Fat Quarter Swap. Check out her blog under "more ish" for details. Here's my new everyday tote (green of course). I think I may try to make a messenger bag this weekend. 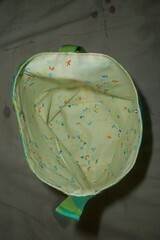 Following are some pictures of some wrist bags that I made. I used a pattern from this book. The green one is currently beeing used to hold my Baudelairs. It's wonderful for on the train because you don't have to worry about pulling anything out of your purse and your yarn is out of the way. And look, A zipper Woo Hoo! 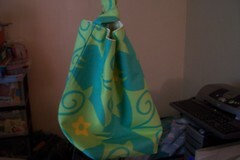 I made this bag as a gift for my friends neice in CT. 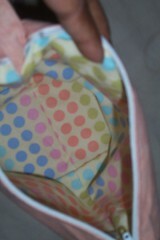 I like the lining but it was a mutha to cut and sew. It kept on slippin and slidin all over the place. 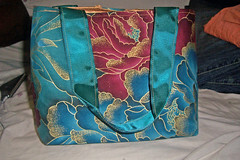 This is the most recent bag I made. I gave this to my boss for her birthday. Don't you just love the ribbon strap and the button. I freestyled the pattern also. Well that's all folks. I was just notified of some relatives and friends who have buns in the oven so expect to see some baby knitting in the future. Also, I think it's about time I get started on the winter knitting, you know hats, scarves, gloves. I also plan on trying to sew my own coat this winter but I'm not 100 percent sure if I'm going to be able to do it. Oh, by the way, sorry I didn't have any pictures from our Barbecue but like a dodo I left my camera home. I want to give the biggest props to Sahara and thank everyone who attended. Thanks for making it an event to remember. I was inspired by Scouts blog to take inventory of all my WIP's. I am by no means a monogomous knitter, never have, never will be. So here are some picks starting with the oldest and ending with the newest. 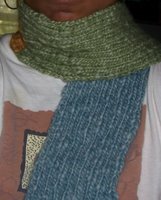 This is a scarf done in 1X1 ribbing. I started maybe sometime around November of 2005. I became bored with it shortly there after. I bought three balls of this yarn that was imported from Italy at one of my LYS. 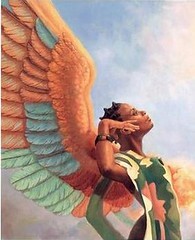 (the name escapes me at this moment). Because of the price, I only bought 3 balls in the colors you see above. Now you know I'm mad because I paid so much for it when I have enough skills now to spin it myself. Dang! I pick it up every now and then and do a row or two when the mood hits me. Maybe I'll be able to wear it this winter. What you see above is a shetland wool type yarn that I got from school products way back when (last year). I bought this book called "Knitting Fair Isle Mittens and Gloves" and fell in love with all the intricate patterns. Here's a picure of the pattern called Diamonds Variation. They also give a good history about the fair isles also. Well, allof the mittens and gloves are knit at a gauge of 32 stitches per 4" on size 1 dpns. After a lot of swatching, frogging and trips to the LYS, I finally got the gauge on size 00 double pointeds. So I started the ribbing around late January. You see how far I've gotten right? I haven't even balled up all the wool yet. I'll finish this one once I finish the scarf above (hopefully). Next up to bat, is a shawl that I'm working on for a charity organization called Purls of Hope. They make knitted items for families affected by AIDS and HIV. The group meets at my job during lunch once a week. You should see some of the things these ladies knit and crochet. I always leave the group feeling inspired. I started this around May. I freestyled it using a lace pattern from one of my knitting stitch dictionaries. Once I block it, you'll be able to get the full effect of the pattern. 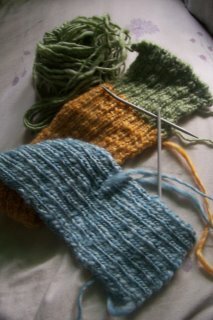 Remember those wrist warmers I was knitting from my handspun yarn? Well I almost finished them. I just have to bind of using EZ's sewn bind off. I ran out of yarn but I'm not too bumbed out about it. I'll keep them as a momento. I tried to do a knit a long with one of my coworkers. We were going to try our hands at felting a tote bag. So far I've done the base and tried working in the round but it is just so nerve wracking to keep on sliding those big old stitches around my Denises'. Sheesh. So as you can see, no progress at all. Here's how my Baudelairs are coming along. This is my commute project because the lace pattern so far isn't that bad. I've already memorized it. I'm about a half an inch away from starting the reverse heel flap. That's all folks. That's not so bad is it? (I'm more trying to convince myself than you). I don't want you guys to be surprised if I turn up with a FO that seems to have appeared out of nowhere. 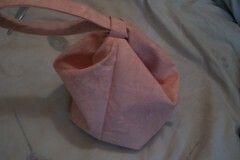 By the way, I made another bag. Can't seem to get enough of those stripes. Happy knitting!